Toughball 2, beautiful close up, even better from a distance... From its special coating to its pin sharp optical trackball, the Toughball 2 is a product of beauty. Hook the Toughball up to a PC with an LCD projector and be staggered at it’s wireless range. Use it with your media center and realise it works from all corners of the room or simply use it as a solid workhorse in the office. Either way the Toughball 2 will not disappoint. Comfortable on and off the desk... Sooner or later you will want to sit back at your desk - only then will you appreciate the sculptured underside and newly designed contoured thumb areas. It’s subtle curves will lock the keyboard on your lap making it far easier to work with than most flat keyboards. 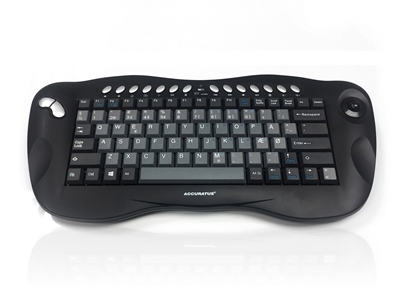 The Toughball 2 has a high resolution trackball giving a very precise, extremely durable and reliable mouse movement. • Reduced packaging, saving the environment with paper and transportation. • Mini keyboard Danish key layout including Windows 8 keys, 2017 version has left Alt key. • Danish Layout is made using our highly durable keyboard stickers which have an excellent and hard wearing finish. Copyright © 2014 Ceratech Accuratus Limited. All Rights Reserved. Built with Volusion.